Located in the heart of San Antonio, our hotel is Centrally located steps away from the Alamo, the Riverwalk, the Rivercenter Mall, the Convention Center, and the Alamodome. Within walking distance of our hotel you will not only find all these attractions, but also the Tower of America, Santa Rosa Hospital, El Mercado Market Square and the municipal auditorium. Brackenridge Zoo -and golf cours- is just 3 miles away, and San Antonio International Airport is 7 miles from our hotel. Also included with your stay is FREE Daybreak Breakfast, FREE Wireless Internet Access, FREE local calls, cable TV with HBO, and seasonal use of our swimming pool is open from 10AM - 10PM 7 days a week. Our rooms also feature a hairdryer for your convenience. 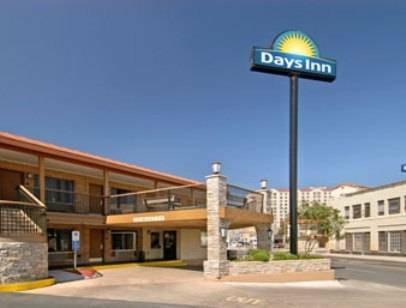 The Days Inn Alamo/Riverwalk puts you right at the center of all that San Antonio has to offer. Feel free to call us direct at 210- 227-6233, or book your reservation online today. PLEASE NOTE Parking is Limited, only one vehicle per room allowed. A daily fee is required.